Located in the heart of the city, this elegant property features sleek details that enhance apartment living. it features 24 hour doorman/security cameras, parking garage, pool, with outdoor grills, wellness center and entertainment room. This unit is beautifully situated on the first floor convenient to elevator and to the outdoor living areas. It has two bedrooms, two full bath with 1442 square feet of spacious open living area that includes living room, dining area, and a kitchen with a countertop bar. The gorgeous large patio is enclosed with a wrought iron fence with a lockable gate that leads to the pool area. 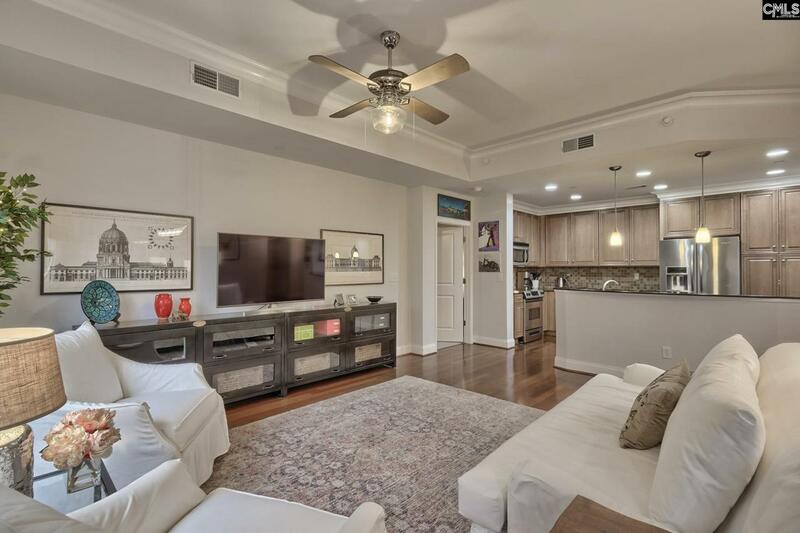 With it's high ceilings, hardwood flooring, amazing kitchen with granite counters, stainless steel appliances, new HVAC unit, full size washer and dryer and updated d'cor, you couldn't ask for anything more! Included with this unit are two parking spaces convenient to the elevator, along with a large first floor storage closet. Conveniently close to downtown restaurants, across the street from the USC Honors dorms and three blocks from the State Capital Building.